Dubai, UAE, October 10, 2018: At Benefit, we believe that the most powerful influencers are our customers. This is why we created and hosted our very first user-generated campaign for the launch of the NEW Brow Contour Pro! In June 2018, nine benebabes from around the world flew to San Francisco, where Benefit was founded, to take part in one of the biggest launches for the brand this year. None of the girls were bloggers, influencers or key socialites; they were just big fans of Benefit Cosmetics, who followed us on Instagram and shared their constant love for the brand. Benefit skimmed through the regions’ major Instagram accounts and randomly selected one girl from each region, including the Middle East! Zain Yehya, a young girl living in the United Arab Emirates, has been chosen amongst Benefit Middle East’s Instagram followers to represent our babes here in the Middle East for this campaign. Zain flew off to Beauty Central office in San Francisco and got to live the benebabe lifestyle for a couple of days, with girls from all around the world! Her first day was dedicated to an “all brow products lesson” by Jared Bailey, Benefit Cosmetics Global Brow Expert, followed by the Brow Contour Pro grand reveal! The second day was dedicated to content creation from A to Z. But guess what? Everything was shot with an iPhone X! This campaign is all about showing girls around the world that you don’t need to be a makeup artist or an influencer to do your brows #LikeAPro – you just need Brow Contour Pro! 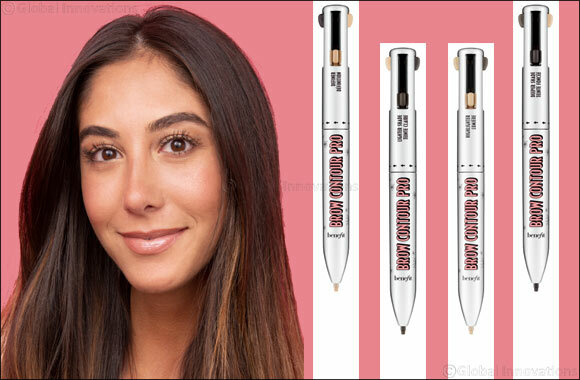 Define & highlight your brows with this 4-in-1 contour pencil. Our multi-tasking brow pencil features a lighter brow shade, deeper brow shade, edge definer and arch highlighter to create clean, shaped brows with depth & dimension. Turn shapeless, flat brows into defined, contoured brows in an instant. Available in 5 shades for a wide range of hair colors and skin tones!